The Biggest Loser: Canine: Paralyzed Lulubelle says, "Eat My Dust!" Paralyzed Lulubelle says, "Eat My Dust!" I love what I do. As a feature writer, I have the opportunity of going out into the community and meeting people who make a difference. That's what happened on Sun., Jan. 30 when I met Dr. Michael Blott, a chiropractor who makes carts, aka wheelchairs, for small shelter dogs in order to improve their chances of avoiding euthanasia and, hopefully, getting adopted by a loving family. Equally impressive was the dedication of Jenny Armour, founder, Open Arms Rescue who brought Lulubelle to pick up her new cart at Michael's home. 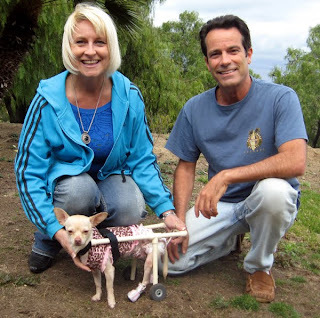 A young chihuahua, Lulubelle was paralyzed after being hit by a car. Jenny was so loving and patient in caring for Lulubelle, making sure she was comfortable and that her diaper was clean. She also bought some tiny leather booties for Lulubelle to wear so she wouldn't scrape her knees when she dragged herself around. I wrote about the transformation in an article in The San Diego Union-Tribune today. You can see Lulubelle before she got her cart, and afterwards when her life changed, on YouTube. What I found most remarkable was that Michael reported that about half the dogs he fits for carts eventually walk again. And 100 percent get homes within 30 days of receiving their cart.